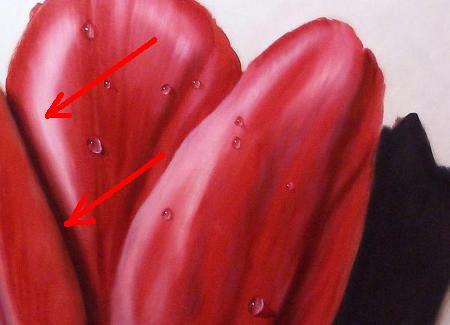 How to Paint a Tulip in oils! 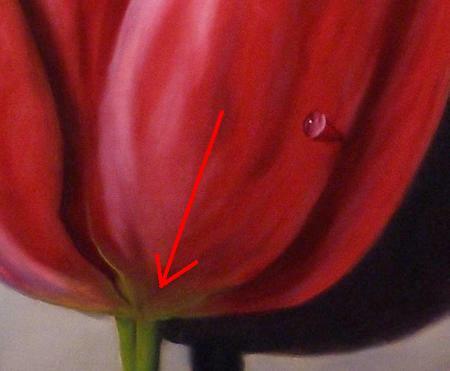 OK, so you want to learn how to paint a tulip. 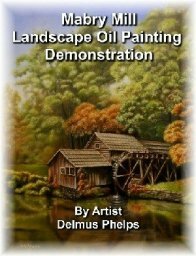 Some of the basics you may already know, but here are some additional tips and techniques to help you create a more believable blossom to add to your arsenal of painting tools. Some things to start off with. 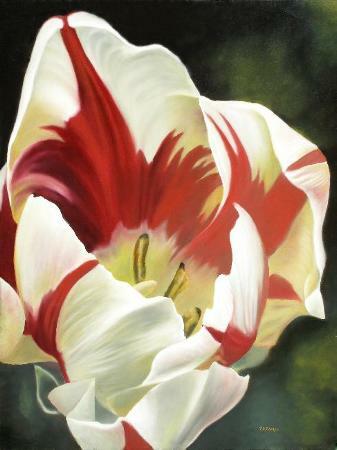 The tulip blossom is very short lived, so if you decide to paint one, photograph it! If you happen to have refrigeration that can hold the blossoms, great, otherwise, capture it while it is fresh. And don't forget to add a few water drops by misting the blossom before you start to paint a tulip, it will liven up the photo. Start with the format you want to depict. 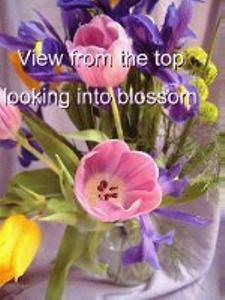 You can do the view in which you look into the flower, or from the side of the flower. Both can give a powerful impact to your composition. Lets say you want a side view. don't forget this simple shape. 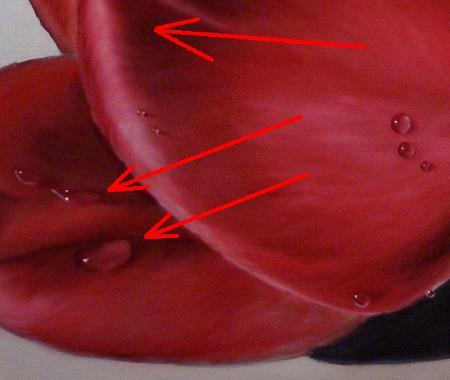 How to paint a tulip with a side view, the most common we see. Remember the tea cup shape! You may also have an ellipse at the top of the tea cup if the angle shows a bit of the inner workings of the flower. In our example, we'll stick with the straight side view. It's just easier to work with. A few closeups show the velvety side. This is depicted with high contrast of your lightest lights and darkest darks. 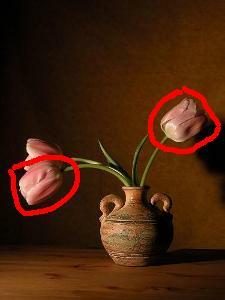 High contrast with lines going in the direction or contour of the petal as shown below. Also, don't forget to add features that help the veiwer understand the modeling or shape of the flower. Here, I've added dew drops under the petal that hang from underneath, yet capture the surrounding light and add a touch of sparkle to draw in the viewers eye to that part of the flower. And don't forget the green within the bottoms of each petal. Without it, the blossom will look like a cutout, cartoonish in nature. Now lets look at a painting with a frontal attack! 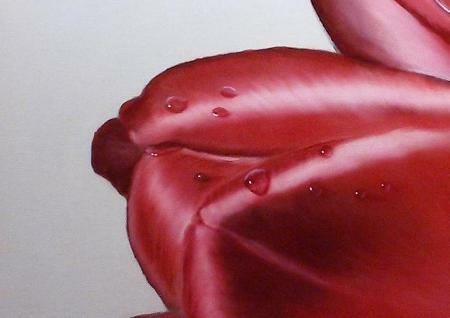 Frontal view of inside the tulip blossom, an oil painting example. depending on direction of light as to where cast shadows will fall. 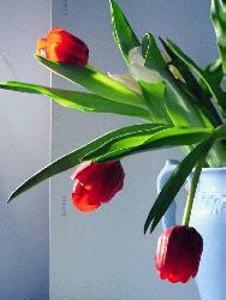 As this tulip blossom had light directly above, cast shadows are on the bottom side of each petal. On the side view, the light source is from the left, so shadows fall to the right. Left blossom shows shadow on front petal creating the illusion that the petal is beginning to curl outward. Only its leading edge has the highlight. A lot of greys and light blues are placed to the highlights to reflect blue sky light. These may not show up too well in the photo, but they are present. The back of the left blossom has reflected light from the table cloth. Close up of ridges with in the petals not usually seen unless observed closely and light is just right. Some of the photos here are courtesy of wet canvas's forum under free photo portion of the site. 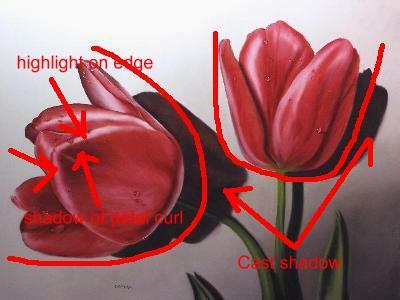 I hope this short description will help you in your painting a tulip! 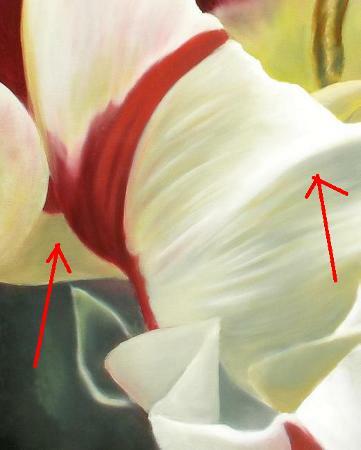 Close observation, and remembering things discussed here should hold true for any tulip you decide to paint. When you've tried one, why not share it with us! 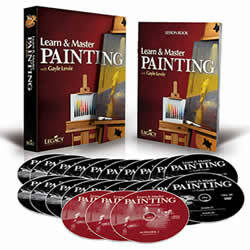 Click here to add your oil painting! To top of our how to paint a tulip page.